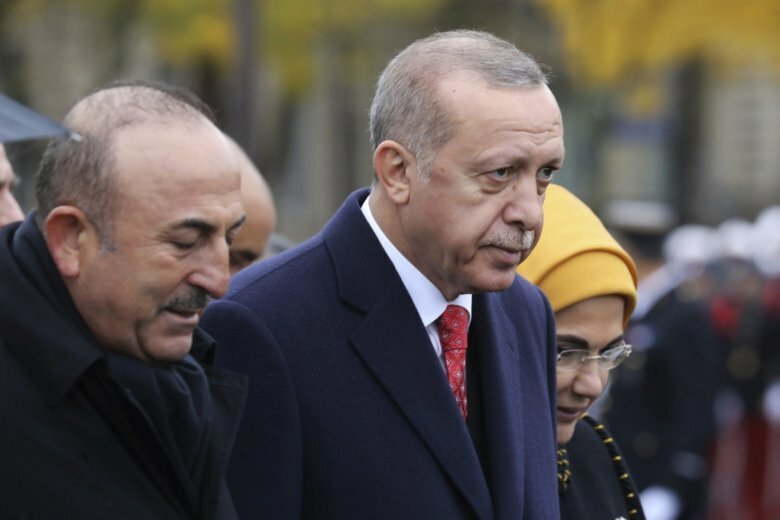 ANKARA, Turkey (AP) — The audio recording of the killing of journalist Jamal Khashoggi is so “atrocious” that a Saudi intelligence official who heard it speculated that “only someone who took heroin” could carry it out, Turkey’s president was quoted as saying Tuesday. Speaking to journalists on board his plane while returning from World War I commemorations in Paris, Recep Tayyip Erdogan also said that Turkey had shared audio recordings relating to the killing with Saudi Arabia and other nations, including the United States, Britain, France, Germany and Canada. “The recording is truly atrocious. In fact, when the Saudi intelligence officer listened to the recording he was so shocked that he said ‘this one probably took heroin. Only someone who took heroin would do it,'” Erdogan was reported as saying in comments published in pro-government newspaper Yeni Safak. Erdogan did not elaborate on how and when the Saudi official heard the recording of the killing of the Saudi citizen. Turkey says Khashoggi, who wrote for The Washington Post columnist and often criticized the crown prince, was killed by a 15-member assassination squad sent from Riyadh. Ankara insists the orders for the killing came from the highest levels of the Saudi government, but not King Salman. Turkey has said a 15-member Saudi “hit squad” strangled and dismembered Khashoggi at the consulate. Media reports have suggested that his body could have been chemically dissolved as it has not yet been found. Erdogan also said Turkey was “patiently” waiting for Saudi Crown Prince Mohammed bin Salman to shed light on the killing at the Saudi Consulate in Istanbul last month. The crown prince has come under scrutiny for having knowledge of the killing, which involved some members of his security entourage. Under mounting pressure, Saudi Arabia has changed its narrative about Khashoggi’s killing. It first said he walked out of the embassy the day he disappeared before eventually acknowledging Khashoggi died inside the consulate. Now, it acknowledges that the journalist’s death was premeditated. On Tuesday, Sabah newspaper, which is close to Turkey’s government, printed airport security X-ray images of the luggage that the 15-member Saudi team reportedly took back with them to Saudi Arabia. The luggage contained five walky-talkies, 10 phones, two electric shock devices, two syringes and scissors, the paper said.